THE SIX GREAT LAKES of North America are Lake Superior, the largest and the deepest, with an area of 31,890 square miles and a maximum depth of approximately 1,180 feet; Lake Huron, with an area of 23,030 square miles and a maximum depth of 750 feet; Lake Michigan, with an area of 22,400 square miles and a maximum depth of 870 feet; Lake Erie, with an area of 10,000 square miles and a maximum depth of 210 feet; Lake St. Clair, with an area of 400 square miles and a maximum depth of over 22 feet; and Lake Ontario. DURING the eight ice-free months of the year, the Great Lakes of North America are among the world’s busiest waterways. With an area of over 95,000 square miles of fresh water, they comprise a natural waterway surrounded by some of the richest industrial and agricultural areas of the North American continent. On these lakes are ship types equal in size to the largest ocean-going freighters, and big paddle ships or “side-wheelers” which would dwarf the excursion vessels of Europe. The Great Lakes witness grim battles against sudden storms, ships sinking and icebound, and lighthouses wrecked, with immense blocks of ice piling round them. Sturdy steam-propelled, steam-heated car ferries plough their way across ice-floes so that train schedules may be kept. All this is happening hundreds of miles away from the sea. The only outlet to the sea from this great freshwater area is the St. Lawrence River; and even that outlet is complicated by natural falls which are now by-passed by numerous canals. Even so, the largest of the canal locks is not big enough to take the largest freighters on the lakes, so that these great bulk transport units are virtually locked within gates of Nature’s making. It is natural, therefore, that the Great Lakes of North America should have produced individual ship types and have developed a tradition of water transport different from that obtaining anywhere else. The whole of the immense transport system, as now built up and including nearly a dozen different ship types, is only of the same age as the industrialization of the North American continent. 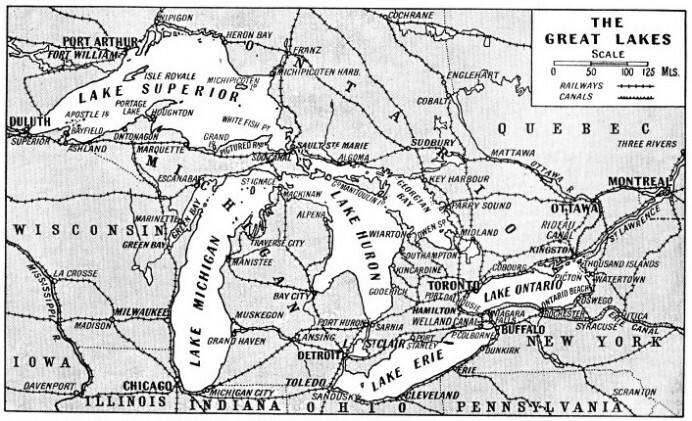 There are six lakes in all, named respectively Superior, Michigan, Huron, Erie, Ontario and St. Clair. Lake St. Clair is a connecting link between Lakes Huron and Erie. Lake Superior is the largest and deepest, with an area of 31,800 square miles and a maximum depth of about 1,180 feet. Lake Huron comes next in area, with 23,000 square miles, but its maximum depth is only 750 feet as compared with the 870 feet of Lake Michigan, with its 22,400 square miles of area. Lake Erie has an area of 10,000 square miles and a maximum recorded depth of about 210 feet. Its comparative shallowness makes it subject to violent storms. Lake St. Clair has a maximum depth of only slightly over 22 feet, with an area of 400 square miles. Lake Ontario, easternmost of the group, has an area of 7,540 square miles and a maximum depth of 738 feet. The lakes are not all at the same height above sea-level. This has necessitated the construction of a series of locks and canals to permit through navigation. Lake Superior, as well as being the deepest, is also the highest above sea-level. There is a drop of some 21 feet over the falls of Ste. Marie to Lakes Huron and Michigan, which, connected by the Mackinac Strait, are each 581 feet above sea-level. Lake St. Clair and the St. Clair and Detroit Rivers connect Lakes Huron and Erie. There is a drop of over 300 feet between Lakes Erie and Ontario over the Niagara Falls and River; this is avoided, as far as merchant shipping is concerned, by the Welland Canal, with its twenty-five locks. The St. Lawrence River flows from Lake Ontario through the province of Quebec into the Gulf of St. Lawrence. Here again there is a gradual drop to sea-level, and the route is partly canalized - six canals and twenty-one locks - between Lake Ontario and Montreal. The New York State Barge Canal System is the artificial outlet for traffic from the Great Lakes. This waterway comprises the Erie Canal from Tonawanda on the Niagara River to Waterford on the Hudson River (339 miles); the Oswego Canal from Oswego on Lake Ontario to Three Rivers on the Erie Canal (twenty-four miles); the Cayuga-Seneca Canal, including the lakes of those names (ninety-two miles); and the Champlain Canal (60 miles). The total mileage of this canal system, including harbours, is 525. Distances on the lakes are greater than would be imagined from a casual glance at the map. From Duluth, the ore port at the western end of the lakes, to Montreal - i.e. the complete length of the system plus the canalized portion of the St. Lawrence River - is a distance of 1,339 miles. From Buffalo, the largest eastern port, to Duluth, the distance is 1,115 miles. The inhabitants of the Northern American continent are an intensely practical race. They have developed land transportation to a fine art, and it is not necessary for them to take to water transport unless it offers some great advantages. In this they differ from island nations such as Great Britain or Japan. Bulk cargoes, such as grain, ore and coal, figure largely in Great Lakes shipment. These are all cargoes for which there are a continuous supply and demand. The speed of the individual unit is not therefore a matter of great importance, but quick handling of cargo is vitally important. Bulk cargo shipment may be compared with a chain of buckets being passed from hand to hand by a group of men to put out a fire. It is not the speed of the individual bucket that matters, but the volume of water given by the buckets. These bulk shipments are due partly to the natural resources of the surrounding districts and partly to the fact that the Lakes form a cheap channel for transportation between the east and west of North America. In Minnesota, for example, round about Duluth, on Lake Superior, there are deposits of readily obtainable iron ore. In West Virginia there are immense deposits of coking coal, and Pittsburg (Pa.) is one of the greatest steel and iron-making centres in the United States. Minnesota sends its iron ore from Duluth via Lake Superior and the Sault Ste. Marie Canal, to the blast furnaces of Detroit (centre of the American motor industry) on the St. Clair River. By the same route iron ore is sent to Toledo. Cleveland, Ashtabula, Conneaut, and Buffalo - all on Lake Erie - partly for transhipment to the Pittsburg and Chicago districts and partly for domestic use. In return West Virginia sends coal to Duluth and Chicago via the lake ports of Cleveland and Ashtabula; this is either used locally or carried farther west by railroad. Chicago, at the southern end of Lake Michigan, sends grain to Buffalo via the Mackinac Strait for distribution in the east and for export to Europe. Grain cargoes reach the Eastern ports in railroad freight cars or in barges via the New York State Barge Canal System; or in small freighters if Montreal is the port of shipment. Chicago also exports steel products in ships of a special type - not greatly differing from the ordinary canal type - to Montreal for re-export to all parts of the world. Calcite, Rockport and Alpena, Mich., export stone in large quantities - limestone for use as flux in blast furnaces and crushed stone for building, road-making and breakwater construction. The Dominion of Canada concentrates the grain of Alberta at Fort William and Port Arthur and sends it via Lakes Superior, Huron and Erie either to Port Colborne, at the entrance to the Welland Canal, or straight through to Montreal, where it is stored before transhipment or shipped direct to Europe via the St. Lawrence River and its estuary. Transportation of these cargoes forms the main activity of the Lakes; there is a certain amount of local package cargo work between port and port as well as coastwise traffic. There is, in addition, a flourishing tourist industry. There are also express passenger services such as that between Cleveland and Buffalo on Lake Erie. These are maintained by some of the largest and fastest paddle ships in the world. They carry 1,500 passengers and crews of nearly 100, and are nearly 500 feet in length. Their enormous paddle wheel engines have a horsepower amounting to 11,000. Navigation on the Great Lakes is possible only between the months of May (late in the month) and December. During the rest of the year the whole of the water area is frozen over. Therefore, the key note of design of the ships on the Great Lakes is quick handling of cargo. Once the navigational season opens there is no “going slow”, and ships loaded with bulk cargoes follow one another in almost continuous streams along the routes mentioned above. In its active months there passes through the Sault Ste. Marie Canal, connecting Lakes Superior and Huron, almost as much tonnage as passes through all the Western Pacific canals in a year. The Welland Canal is almost as busy, although with a smaller type of ship. We have already mentioned the varied types of ships operating on the Great Lakes. One of the most important classes is that which may generically be called “bulk freighters”. These are the ships that carry the enormous loads of iron ore and coal. The true Lake type ship has a length of about 600 feet and a cargo capacity of about 13,000 tons, a moulded beam of 60 feet and a depth of 30 feet. These ships are, in effect, colossal barges, for they are all hatchway amidships and their middle body, as it is known, is practically straight. At the forward end is a large wheelhouse with a semicircular front situated on the forecastle. The accommodation in this part of the ship is luxurious, and frequently includes special staterooms for the owner. The bridge is forward and the machinery aft, so that a clear space is provided for rapid loading and unloading. As the bridge and navigating quarters are so far forward, it is impossible for the steersman to see in which direction the ship is heading. A steering pole is therefore fitted forward. This is kept hoisted in a vertical position when the ship is idle, and it is dropped horizontally in the manner of a bowsprit when the vessel is running. By watching the pole, the man at the wheel is able to correct the direction of the vessel. These bulk freighters must load and unload quickly. One Lake ship loaded 14,245 tons of coal in four hours thirty minutes, at a rate of 3,165 tons of coal an hour. Grain has been handled at the rate of 355,000 bushels in five hours, an average of 71,000 bushels an hour. Grain can be taken out of a ship at the rate of 30,092 bushels an hour. Cargo-handling devices are almost human in their ingenuity. Enormous grabs holding several hundred tons at a “bite” come down into the vessel’s holds and help to get her ready for “sea” in a minimum of time. Naturally the hulls have to be extremely strong to stand the ill-treatment that they receive. 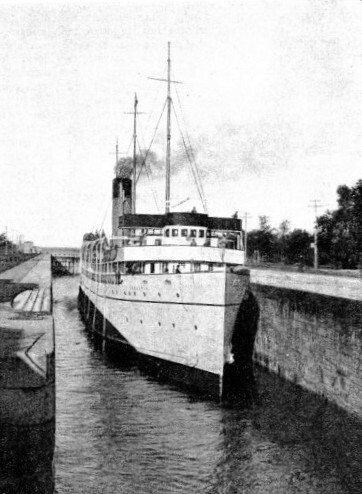 A DEEP-WATER LOCK at Sault Ste. Marie on Lake Superior. The Sault Ste. Marie Canal connects Lake Superior with Lakes Huron and Michigan, and passes through one of the world’s greatest locks, 900 feet in length, 60 feet wide and 21 feet deep. The Canadian Pacific lake steamer Keewatin is here seen passing through the lock. In some instances, when vessels are trading to ports where the unloading gear on shore is only fairly good, they use their own system of handling cargo. One ore carrier with a deadweight capacity of 12,000 tons, is fitted with a cantilever belt discharge, and has an unloading rate of about 1,800 tons an hour. Cement in bulk is another interesting cargo carried on the Great Lakes. Compressed air must be employed to discharge such a cargo. In certain instances, screw conveyers are used for this type of freight. Ships carrying coal on the Great Lakes frequently have railway lines on their decks for quick loading, so that the railway trucks can be run on to the decks just as though the ships were train ferries. The bottoms are dropped out of the trucks and the coal is served by gravity into the holds. Other ships are intended for carrying steel plates and shapes for big steel works in the Chicago district. These vessels are of the usual Great Lakes type, except that they are small enough to go through the Welland Canal. They are fitted with enormous electric cranes that enable them to lift out the large plates and angle bars at the port of discharge. The smaller freighters on the Great Lakes are the same, in miniature, as the great ships described above. Their size is governed by the size of the smallest lock in the Welland Canal. Because of the limitations of this lock, the large ships cannot operate east of Buffalo. The small ships, limited to about 250 feet in length, pass through the Welland Canal, navigate the St. Lawrence River to Montreal and Quebec, and can trade on the coasts and as far south as Jamaica in the winter months when the lakes are closed. It is, however, generally more economical to lay them up. There is also a third group - cousins to the “canallers”, as the Welland ships are called - the New York State Barge Canal group. This group comprises freighters capable of navigating the Welland Canal, and of clearing the lowest bridge on the Barge Canal. They are thus again restricted by the 15 feet head-room of this bridge. Bulk freighters are easily the most numerous class of ships on the Great Lakes. General cargo ships are usually known as packet freighters. These are modified bulk freighters; with cargo derricks and masts. Otherwise they retain all the characteristics of ships of the Great Lakes. Canal freighters operate over the whole of the Great Lakes system and also through the Welland Canal and the St. Lawrence River to Montreal and Quebec. Generally speaking, the canal freighter is similar to the lake freighter, but with a slightly modified structural arrangement of hull. She spends a considerable proportion of her life getting in and out of locks, and as contact with gates and walls is frequent it sometimes damages the hull structure. The “canaller” generally proceeds at full speed into a lock, trusting principally to the cushion of water thus formed to check the impetus of the ship. The locks on the Welland Canal and Lachine Canal systems are numerous and awkward to navigate. For example, between Port Colborne and Montreal there are no fewer than forty-six locks in some 387 miles. With a few exceptions, passenger services on the Great Lakes are maintained for pleasure cruising or excursion purposes. Many ships so engaged operate for a short period each day, being restricted only by ice, in common with other craft. Night services, such as those between Cleveland and Buffalo, Cleveland and Detroit and Detroit and Buffalo, have produced the largest, most complete and most luxurious “side-wheelers” in the world. The tourist traffic from Buffalo and Chicago has given rise to a special type of passenger ship which cannot be found anywhere else in the world. 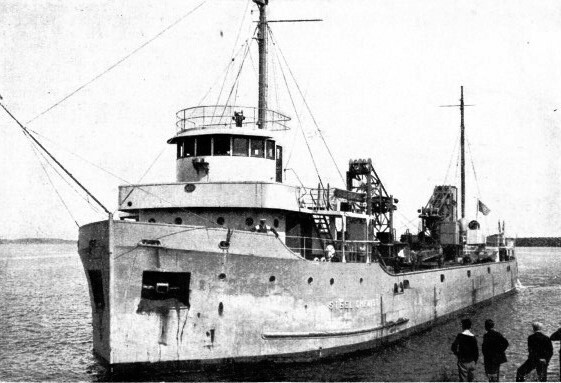 It has been adapted from the Great Lakes freighter. The giant paddle ships of the Great Lakes vary in size from the Greater Buffalo (519 feet long) to the Western States (350 feet long). The whole of the immense superstructure is built up over a deck known as the main strength deck. This has one partial deck below forward and aft of the machinery space, with four full passenger decks above. The after end of the main deck contains the entrance lobby, and is shut off from the rest of the deck by the galley. Forward of the galley, practically the entire main deck space is devoted to package freight and motor cars. It is served by side doors and obstructed only by boiler uptakes. Crew accommodation is forward on the lower deck; aft on the lower deck are the stewards’ quarters. The most striking feature of the passengers’ quarters is the large well extending fore and aft for a distance of 70 feet or so, with a width of 20 feet. This well pierces the two upper decks. From the point of view of stability, paddle propulsion is a great advantage for ships with such high superstructures as these. It also gives increased deck space, because the deck can be widened out to come flush with the paddle casing without increasing the breadth on the water-line. This arrangement is not possible for paddle vessels except in smooth water. In a ddition to all the varied ship types mentioned above, the Great Lakes support craft of the more normal kind, such as tugs, dredgers, salvage vessels and lighthouse tenders. THE GREAT LAKES FREIGHTER is an immense self-propelled barge with machinery aft and accommodation forward. Many are engaged in the transportation of bulk cargoes such as grain, coal and ore. In this service they set up records for loading and discharging. Others are specialist craft with self-discharging appliances. The Steel Chemist is one of these vessels. She has been designed with bluff bows to negotiate the locks of the Welland Canal and with electric cranes to unload steel plates and similar cargoes as quickly as possible. You can read more on “Adventures of the Ice-Breaker”, “Canada’s Prairie Port” and “New York - Key to a Continent” this website.